Posted on Nov 3, 10:07 PM in Soups. No comments. Leftover pumpkin? 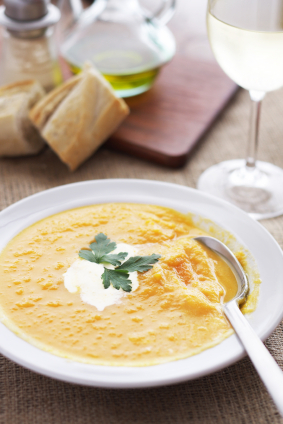 It’s a perfect time to turn those leftovers into a warm and tasty soup. Combining with smoked haddock adds that extra dimension to the dish. Haddock is starting to be at its best in november and is a nice firm fish that will sit well in soup. Nutrition-wise it’s excellent! Haddock is low in calories and high in protein, magnesium, B Vitamins and also contains a reasonable amount of omega 3 fats. Heat the oil in a large, heavy based saucepan and gently cook the onion, garlic and celery for about 10 minutes. This releases sweetness but doesnt lose the colour of the vegetables. Add the pumpkin and the potatoes and stir to coat the vegetables with the oil. Gradually pour in the stock and bring to the boil. Cover, then reduce the heat and simmer for 25 minutes, stirring occasionally. Stir in the dry sherry, then remove the saucepan from the heat and leave to cool for 5-10 minutes. Blend the mixture in a food processor or blender to form a chunky puree and return to the cleaned saucepan. Meanwhile, place the fish in a shallow frying pan. Pour in the milk with three tablespoons of water and bring to almost boiling point. Reduce the heat,cover and simmer for 6 minutes or until the fish is cooked and flakes easily. Remove from the heat and, using a slotted spoon, remove the fish from the liquid, reserving both the fish and the liquid. Discard the skin and any bones from the fish and flake into pieces. Stir the fish liquid into the soup, together with the flaked fish. Season with freshly ground pepper, stir in the parsley and serve immediately.